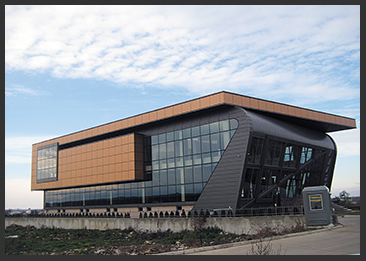 The transfer of production experience gained in almost half century with tailor model precision to composite panel production in Sistem Metal and the responsibility of being the leader company in sector whose unique job is to manufacture aluminium composite panel gave birth to ALBOND brand and enabled the product to achieve a considerable position among the highest quality materials of Europe. Our Company, which began to produce aluminium composite panel on the first line with annual capacity of 1.500.000 m2 in the second quarter of 2005 in Beylikdüzü/İstanbul plant, increased its capacity to 2.000.000 m2 in 2009 thanks to the improvements. Albond,which increased its production line number into two with the investment of more modern and higher technology line after the new factory building with closed area of 16.000 m2 whose foundation was laid in 2009 in Çorlu/Tekirdağ and raised its production capacity into 4.500.000 m2, became the biggest national producer of our country. Albond strengthened its position in the sector by combining its ambition in quality composite panel production with fast service and production power thanks to moving the production line in Istanbul plant to Çorlu factory. ALBOND increased its annual production capacity 7.500.000 m² thanks to its four composite panel production lines in its factory located in 30.000 m² closed area with the investments made in 2010 and after. It has continued to present innovations and diversities in the sector with the fourth line capable of producing 2 meters wide aluminium composite panels in addition to the A2, B1 and B2 fire classes panels production.